Although so far our adventures in archival cooking have been mostly meatless, the recipe books in Penn’s collections contain many interesting preparations for meat, poultry, and fish. From a recipe to “Stew a Hare” to instructions for how to make “English Bacon” and “Pickle Pigeons,” these recipe books reveal a no-waste, “nose to tail” approach. Most either use the whole animal in a single preparation or preserve meat for future consumption. However, many of these recipes do not lend themselves to modern, apartment cooking (especially during the Philadelphia summer). 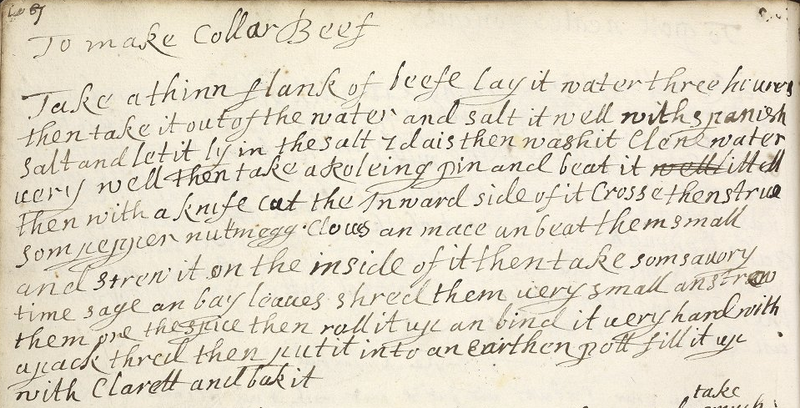 Alyssa and I were thrilled to find this relatively simple recipe for “Collar Beef,” or braised flank steak seasoned with fresh herbs, in Ms. Codex 252. Collar Beef is a flavorful and relatively inexpensive recipe for red meat. The flank steak is prepared with salt, dressed with a mix of savory herbs, rolled and trussed with string, and braised in red wine. “Clarett” was (and still is) a common name for red Bordeaux wines in seventeenth- and eighteenth-century England. We used an inexpensive Bordeaux blend. Instead of soaking our steak for three hours and then salting it for a full day, we salted ours for a few hours before we began cooking. At the advice of our butcher, we also did not pound the steak with a rolling pin; instead, he butterflied the cut for us. We couldn’t find the herb “sauory” in our local markets, but we both thought it would be a nice addition to the spice mix to try it if you have it on hand! We also decided to add dry bay leaves to the wine instead of including fresh bay leaves in the roll as they are not always kind to the stomach. * Adjust seasoning based on quantity of meat and taste. A few hours before cooking, lightly salt the flank steak and allow it to rest at room temperature. Wash off any remaining salt and pat the meat dry before proceeding with the recipe. Open the butterflied steak and rub the inside with the dry herbs. Close the steak, then spread the layer of fresh herbs on top. Roll the flank steak (we rolled width-wise, to create a shorter and fatter roll than rolling length-wise) so the herbs are encased inside. Tie the steak in 2-3 places with string. Slice into rounds to serve. “Collar Beef” was intensely flavored with wine and herbs. The method of salting and braising the tenderized the notoriously tough flank steak. We found that the central slices were the most balanced. Next time, we might add some chopped garlic and parsley to the herb mix.